A. O. Mohammad | K. K. Eleja & Co. He graduated from the Faculty of Law, Bayero University, Kano, Kano State in the year 2011 where he bagged his LL.B degree in Common and Islamic Law. He was later called to the Nigerian Bar in November, 2012 and thereafter had his National Youth Service Corps programme (2013) at Government Day Senior Arabic Secondary School, Katanga, Kiyawa Local Government Area, Jigawa State where he taught English Language. 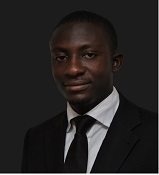 He has since been engaged in active law practice, having joined the firm in February, 2014. In addition to advocacy, he has flair for solicitorship work. He bagged his Masters Degree in International Law from the University of Ilorin in December, 2016. Bayero University Kano Alumni Association.